A French-Algerian footballer "trapped" in Qatar for two years because his club would not permit his departure is now able to go home, his brother says. Zahir Belounis, who is in dispute with his club El-Jaish over unpaid wages, says he has been held against his will because of Qatari labour laws. A delegation from global players' union Fifpro was due to meet Qatari authorities and the player on Thursday. But his brother Mahdi Belounis said on Wednesday: "Zahir has his exit visa." Mahdi Belounis, who has been highlighting his brother's case and calling for him to be allowed to leave the Middle East state, added on Twitter: "Zahir will finally be in Paris tomorrow." Under the Qatari "kafala" system, migrant workers are effectively tied to their employers, who must agree to their departure from the country. Zahir Belounis said his club would not grant his 'exit visa' because of the dispute, even when he offered to drop his claim for unpaid wages. Earlier in November he wrote an open letter to 2022 World Cup ambassadors Zinedine Zidane and Pep Guardiola to publicise his plight. 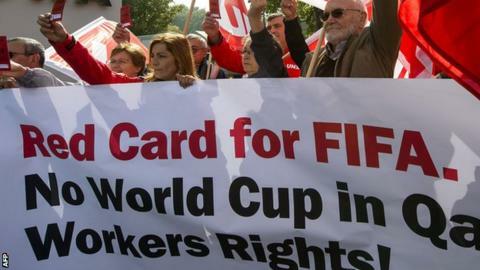 The treatment of migrant workers helping to get the nation ready to host the 2022 tournament has been widely criticised in recent months although the football authorities have pledged to act. A Fifpro spokesman said: "As the worldwide representative for professional footballers, Fifpro will be able to welcome back a long-lost family member."